The best online bachelor’s degree program will offer the major you want to study and the best resources to help you achieve your goals, all at a price tag you can afford. Finding a program that checks all of those boxes can be an overwhelming endeavor: Over 80% of public and half of private universities offer programs that are totally online. But if you do the groundwork to figure out what you’re looking for, you can make a decision-dense process more efficient. The fastest way to narrow down schools is to decide on your desired field of study. If you know your career goals, this step may be the easiest part of the process. Name your major, and you’ll be able to use that information to filter out programs that aren’t worth looking at when you approach online search tools. When you’re ready to start your journey, head to U.S. News & World Report’s tool for online bachelor’s degree programs and filter results by major; that will give you a feel for how big your pool of potential programs is. If you’re not sure, take a look at the resources available to undecided students online at sites like The Princeton Review and BestColleges.com, or look at typical salaries in your area based on career for some ideas. You might even try searching LinkedIn and contacting professionals in your area who are working in fields that you find interesting. Already have some specific programs in mind? LinkedIn lets you filter search results based on where people went to school. Finding graduates of a program you’re considering could give some insight into where graduates land and gives you a chance to reach out to those graduates for specific program pros and cons. But one major draw cited by U.S. News & World Report is that for-profit colleges tend to be less selective — an indispensable pro for some students who don’t have competitive grades or standardized test scores. For-profit schools also tend to operate on a rolling admissions schedule, which is helpful for students who want to start school right away (although many nonprofit institutions we looked into also enroll on a rolling basis for their online programs). Regardless of whether the schools you’re looking at are nonprofit or for-profit, any school you consider needs to be accredited by a recognized accreditor so you avoid sinking money into a diploma mill (read: a school that cranks out diplomas — usually by offering claims like “earn your degree in three months!” — without adhering to recognized standards). If your degree doesn’t come from an accredited institution, future employers and graduate schools may not recognize your hard-earned credits. In addition, only colleges that are accredited by USDE-recognized accreditors are eligible to receive federal financial aid. The stakes are high, so it’s worth putting some time into your research. Regionally or nationally: Regional accreditation is most likely to be recognized by other schools. In other words, your credits are more likely to transfer across regionally accredited institutions than from a nationally accredited school to a regionally accredited school. If you’re considering grad school in the future, keep that in mind. Most nonprofit institutions are regionally accredited, while for-profit institutions and vocational schools tend to be nationally accredited. Institutionally or specialized: An entire school and all of its programs may be accredited, or a more targeted accreditation may be given to specific programs. For example, the Accreditation Commission for Midwifery Education specializes in accrediting midwifery programs. But don’t take a stamp of accreditation at face value. Fake accreditors are out there, putting their fake stamps on schools in an effort to rope students in with a guise of legitimacy. The good news is it doesn’t take much to sniff out those bad actors. Legitimate and respected accreditors are backed by the U.S. Department of Education (USDE) or the Council for Higher Education Accreditation (CHEA), and some are backed by both. Those organizations review accreditors and “recognize” them if they’re up to par with their strict qualifications. To find out if the schools you’re considering are accredited by the right organizations, call the schools or find their accreditor (or accreditors) on their websites, then find that accreditor on this list of USDE and CHEA recognition. If you’re still concerned, check out Get Educated’s list of accreditors frequently used by fake colleges. What does fake accreditation look like? The overall vagueness was already a red flag, and we didn’t find WAUC on the list of accreditors recognized by the USDE or CHEA. And the nail in its coffin: WAUC is on the Get Educated list of fake accreditors. 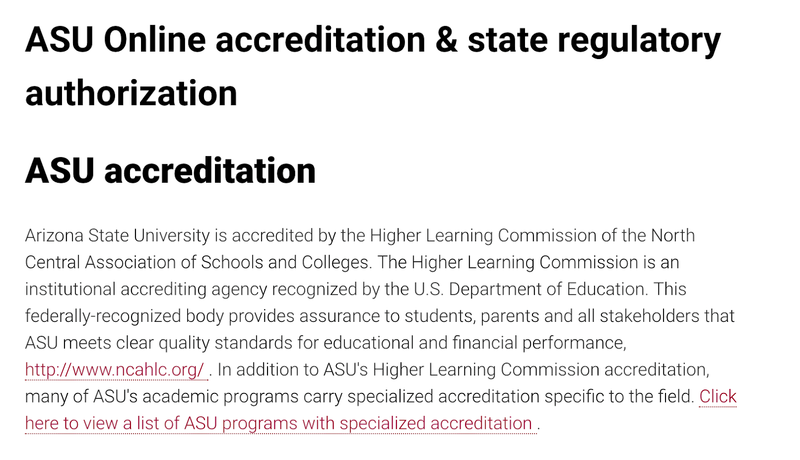 In comparison, Arizona State University’s website features direct, specific language that explains its accreditation by the Higher Learning Commission of the North Central Association of Schools and Colleges. It took just a few seconds for us to check the list and verify that the Higher Learning Commission is recognized by both the USDE and CHEA. Once you know what schools meet your broad requirements, it’ll be easier to approach online search tools like U.S. News & World Report and Guide to Online Schools, which give more insight into what a program will be like once you’re in. The right program for you will offer resources that help you succeed and will address your specific needs. Take some time for introspection: Your schedule, how you learn best, and your career goals will all come into play. A survey of online students found that, behind the availability of scholarships, grants and/or assistantships, and courses being offered year-round, “courses that are self-paced/do not have set deadlines” was the third most important factor in choosing a program. Essentially, this can mean courses with no set class meeting time and with the flexibility to let you learn at your own pace. That may be because, according to data from U.S. News & World Report, an average of 84% of online bachelor’s students are employed when they apply. If your goal is to work full-time while you earn a bachelor’s degree, one of your priorities will be scheduling flexibility. You might only consider programs that offer asynchronous classes — classes that don’t require all students to be online at the same time for lectures and “in-person” interaction. On the other hand, that interaction might benefit you if you learn best in a discussion-rich environment; if that’s the case, you may look for programs that offer synchronous classes in the evening or an “integrated program” with some in-person commitments. To shed light on the finer details that help differentiate programs, reach out to admissions offices at schools you’re considering and dive into program websites. If you’re considering multiple programs at this point, though, U.S. News & World Report’s individual school profiles are a good source for finding information like the most popular major at a school, average class sizes, and what types of classes are offered. After finding a few with features you like, you can then compare the features across schools. If you have existing college credits already, you’re in good company: Data from Aslanian Market Research shows that 80% of online undergraduate students have earned credit elsewhere and prioritize transferring that credit when choosing a program. The numbers U.S. News & World Report reports are even higher at 95%. To transfer credits, you’ll need to request an official transcript from the school(s) where you’ve earned college credit and have it sent to the programs you’re considering. In the meantime, you can always contact a prospective school’s enrollment counselors and ask how many credits they might expect to transfer. Or if you’re not ready to get on the phone, some schools — like Arizona State and Penn State — offer online tools. Unsure on how to transfer your credits? Read this piece by U.S. News & World Report. It gives deeper details on what might affect transfer, first-hand accounts from students who’ve transferred credits, guidance on the right questions to ask, and how to push back if your requests are rejected. You might decide that if a program meets your prior criteria, cost doesn’t matter. However, it will likely become a factor at some point in your decision-making process. Online degree-granting programs typically charge per credit hour, but a survey of online students found that per-credit is the least-favored way to think about price. That makes sense to us: Per-credit pricing doesn’t paint a full picture. One way to get a rough estimate of how much you might actually pay over time is to multiply the number of credits required to graduate (usually about 120) by the cost-per-credit. But your actual costs might also be affected by a few other factors that you’ll have to consider as you look deeper into specific programs. Tuition may vary based on any given school’s policies and usually rises year to year. Some schools charge less per credit hour if you take more classes at a time, and some charge a flat rate once you hit a certain number of credits (this is sometimes seen as a case in favor of full-time enrollment). And public schools often charge much more per credit for out-of-state students than for students who live in-state. We found in-state and out-of-state tuition to be listed front-and-center on the program websites we looked into. But once you’ve narrowed down your choices, dig into schools’ websites or check with an enrollment counselor at the schools you’re considering to see if your tuition might change based on the number of credits you’re planning to take. Fees for using technology, taking assessments, or even graduating a program can be hiding in a program’s costs — we recommend checking with an enrollment counselor and reading the fine print on prospective programs’ websites to get the full picture. For example, on Penn State’s World Campus website, we found that technology fees range from $86 to $252 for undergraduates. Consider the supplies you need for an online program. This school supplies list for online students from U.S. News & World Report includes a relatively new computer and a reliable internet connection. You may already be set; if you aren’t, make sure to talk to the admissions departments at schools you’re considering to find out exactly what hardware and software you need to get the most out of your program. Financial aid can help, and you may choose to fill out the Free Application for Federal Student Aid (FAFSA) to see what grants, loans, or work-study funds you’re eligible to receive. FAFSA deadlines vary by state and school, so be sure to check on the deadline for the schools you’re considering early on in your search. Remember that accreditation may play a role in the type of aid you’re eligible to receive — look for schools’ accreditors with a stamp of approval from the USDE if you want to receive federal funding. You might also want to browse a scholarship search platform to find the outside funds for which you’re a competitive candidate (check out our review of best scholarship search platforms for a good place to start). Earning an online bachelor’s degree typically takes four years. However, there are types of degrees known as accelerated online bachelor’s degrees, which can reduce this time. The trade-off, however, is that you usually have to study harder to make up for a reduced timeline. Is it possible to get an online bachelor’s degree in two years? Accelerated online bachelor’s degrees usually compress a traditional course timeline of about 16 weeks to a shorter span of 10, 8, or even 5 weeks. Universities like Western Governors University and Capella University also offer flexible programs that make it easier to fast-forward through your studies, especially if you are already proficient in certain areas; these programs allow you to take courses at your own pace and move forward whenever you’re ready. According to U.S. News and World Report, in-state students pay an average of $305 per credit for online bachelor’s degree programs, with the cheapest option ringing it at $92 per credit. How much you spend will depend on where you live, your major, necessary supplies, and any unique tuition fees affiliated with your university of choice. To get a better idea of what factors influence cost, check out our guide to tuition and fees. To work backward from well-paying jobs in your area, poke around PayScale’s map that lets you explore the salaries of different professions by location. Message people in your area on LinkedIn who are doing jobs you think might be a fit. Later in the process, consider contacting people who’ve graduated from the schools you’re considering. For schools you’re considering, check to ensure that their accreditors are USDE-recognized. If they are, the schools (and therefore you) are eligible for federal aid. Check the deadline for your FAFSA at the school(s) you might attend and fill one out to see what federal aid you’re eligible to receive. Read our review of best scholarship search platforms and look into outside scholarships for which you might be competitive. Before applying, find out each potential school’s accreditor and make sure that accreditor is on this list of USDE- and CHEA-recognized agencies. Read more tips from Business Insider on how to spot a diploma mill (one tip: Avoid colleges with pseudo-official sounding names like “Columbiana” and “Barkley”). U.S. News & World Report collects data from schools in four main categories: student engagement, faculty credentials and training, student services and technology, and peer reputation. The site then ranks schools based on that data. Thanks to that wealth of information, you can go to the site and filter schools by available majors, tuition, enrollment, school type, and program type, then dig into individual programs and compare schools. The same site keeps a blog with helpful posts on subjects like which student services to contact before you start your program, how your personal goals might factor into your decision, additional factors to consider when you’re doing your research, and what questions you might want to ask current students before committing to a school. The Guide to Online Schools offers rankings as well, although its methodology is less transparent. Still, it’s worth a look as a second source of information while you do your own research into each program.